This is a wonderful and picturesque harbor complex located in Pantai Kok area of Langkawi on the western coastline. It covers 27 acres of basin area and includes a full serviced marina for yachts & sailboats and a shopping complex with a board walk that also has several upscale restaurants & bars. Telaga Harbor park once used to be a sleepy fishing village. LADA (Langkawi Development Authority) has built a modern and sophisticated marina with comprehensive berthing facilities and added Perdana Quay which is a harbor-side complex having a boardwalk with several waterside restaurants, bars and shops to make it a great attraction for both yachters and tourists. In the evenings when all the lights are put on, Telaga Harbor Park looks gorgeous and awesome. 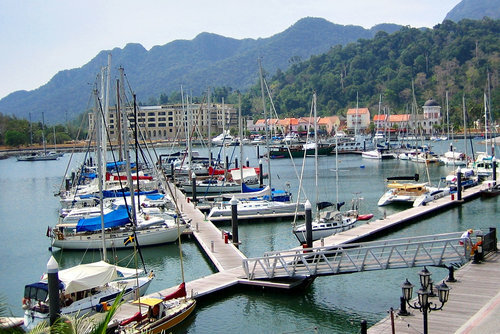 The marina is today home to many passing as well as Langkawi based yachts of various sizes including mega yachts. It has now become a self contained township and is only such harbor town in the entire region. You can come to the harbor and enjoy sailing. Annual International Water Festival is held during the first quarter of the year when you can participate in many water based activities and games held in the harbor park. This is a small but a complete harbor town offering berthing facilities for small to mega yachts, full marina services, yachters work places, hotels, restaurants, bars, shopping, bank with ATM facilities, Petrol Station etc. Perdana Quay: A commercial complex with many retail boutique shops, restaurants, bars as well as spa. There is a boardwalk and waterside restaurants here offering different cuisine including Japanese, Russian, Arabic, Italian, Continental and Western. This is an excellent opportunity for tourist to experience and enjoy some time with the yachters who mainly patronize the quay and the harbor park. The marine infrastructure is managed and operated by Telaga Harbour Sdn Bhd. The berths are given out on rent or lease. You can contact the company (contact information given below) to know the rates. 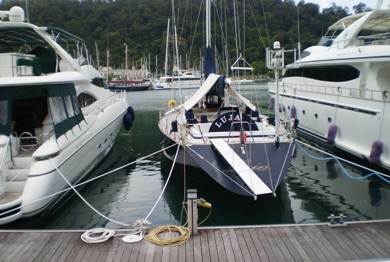 This is one of the only two marinas in Langkawi (the other being in Kuah) where sailing yahchts can clear in and out. The marina has Harbor Master, Customs and Immigration offices. Petronas Quay is located at the southern side of the harbor and offers Fuel & Bunkering Service, Bank with ATM & Forex, Postal Service, Mini Market & Souvenir, Fast Food & Bakery Café, Business Center with Internet access. High speed wi-fi broad band connectivity is available throughout Telaga Harbor Park. You will need to collect the User Id and the Password from the Marine Office. The Marine Office (also known as the Blue House) has Shower & Laundry Facilities, Stowage, Work Platform, Sailors' Lounge with TV etc. It also houses the offices of Dock Manager & Marina Administration. The marina has 24-hours security. The berth holders are able to use cards issued my the authority to access the marina 24-hours through electronically operated gate. Note that while Perdana Quay complex has few shops, they are mostly specialized and may not be good for provisioning for the yachters. For provisioning, you will need to drive down to either Padang Matsirat (about 15 minutes by taxi) or Kuah Town (about 30 minutes). Kuah is the commercial hub and capital of the island, and has all sorts of stores for provisioning. Koh Lipe is a tiny island and a fishing village which is part of Thailand and located north of Langkawi. The island which is part of Turatao National Marine Park is a great diving location as well. There are daily ferry services that operate between Telaga Harbor Ferry Terminal and Koh Lipe between May to October. The distance is about 30kms and it takes about 1 hour by ferry. Check out Langkawi Ferry Services for schedules, rates & other details. The admission to Telaga Harbor Park for tourists is free. Sailors needing berthing facilities at the marina will need to contact the Marine Office for berthing rates. Open Daily. The restaurants at Perdana Quay usually open around 11am and remain open till late evening and some beyond mid night. 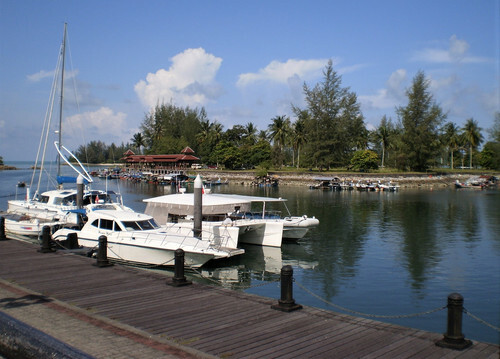 Telaga Harbor Park is located in Pantai Kok Area and on the road Jalan Telok Burau. It is 15 minutes by car/taxi from the Langkawi International Airport and about 30 minutes from Kuah Town Center. VHF Channel 69 / 72; Call sign: "TELAGA HARBOUR"